The first thing that came to mind when I smelled the tea for day 19 of the 24 Days of Tea advent calendar is that it smells like marzipan. Sweet Almond Green smells like almonds, almonds, and more almonds – which shouldn’t come to anyone as a surprise given the name. Sweet Almond Green is made up of green tea, almonds, marigold flowers, cornflower petals, and natural almond flavouring. 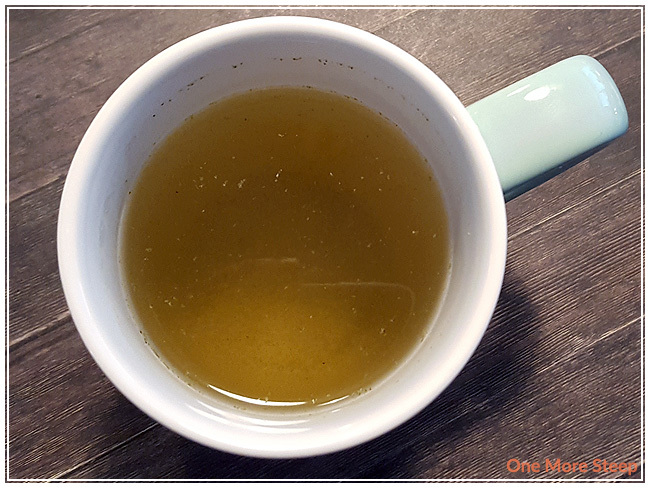 Steeping recommendations for Sweet Almond Green are to steep with hot water (75-80°C/167-176°F) for 3 to 5 minutes. I steeped my cup of Sweet Almond Green for 3 minutes. Sweet Almond Green steeps to an almost murky yellow-green. There’s a salty smell to it, that comes from the green tea, and then there’s the almonds (from the almonds). It still smells like marzipan, and I’m not sure how I feel about drinking my candy when marzipan isn’t a favourite. 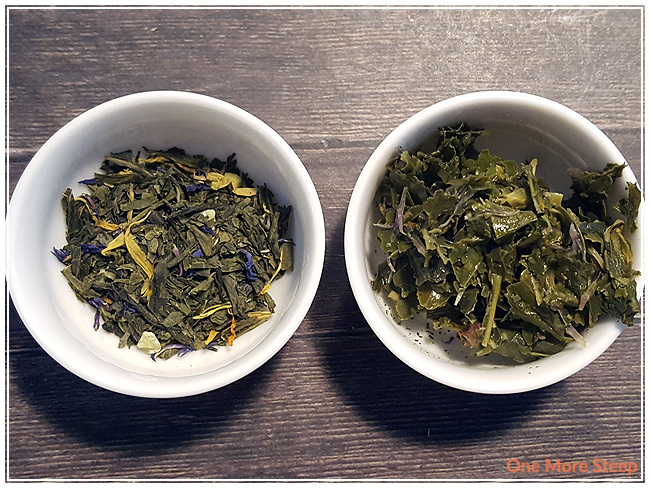 The salty seaweed-quality of the green tea is heavily present, as is the almond from the almonds and the almond flavouring. They do not balance well together to form a cohesive flavour profile. I did not resteep Sweet Almond Green. 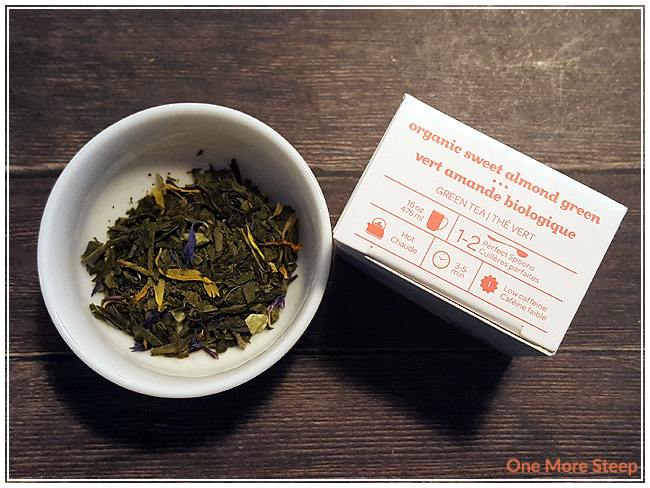 I didn’t like DavidsTea’s Organic Sweet Almond Green. 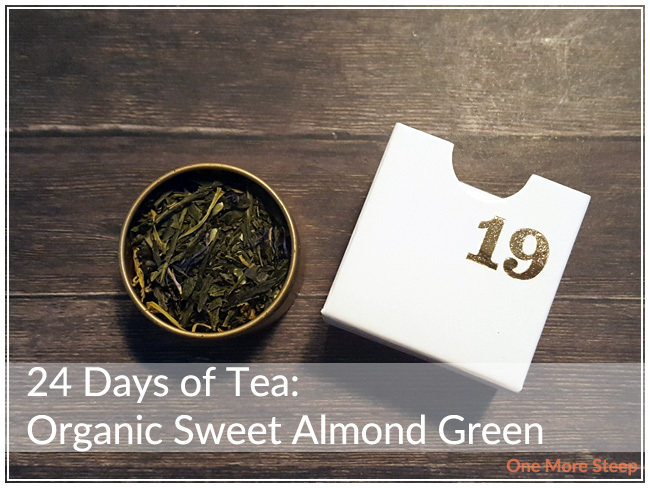 There’s just something about the almond and the salty flavour of the green tea base that do not mingle well together for me. It probably doesn’t help that I’m not the biggest fan of marzipan either! If you’re a big fan of almonds and/or marzipan, this might be a better tea for you than it is for me.